About this time next week, if all goes according to plan, I will be packing up Rainy’s things, feeding him a few last carrots, and sending him off to live with a friend. She will be evaluating him, training him, and ultimately finding him a new person, and a new future. He’s bored and lonely here, and too talented to spend his youth puttering around my backyard with just two donkeys for company. Rainy will be taking a day-long trip north to the bay area, in a big box stall on an air-ride semi-trailer. At the farm he will be living in a pasture with three playmates, and will be working with a trainer several days a week. It’s going to be a little rough on me, saying goodbye, but he’ll have fun there. I am giving up riding. More accurately, I am giving up lying to myself about being a rider. Sure, I’ll go out with friends, or to a dude ranch now and then, but I’m letting go of saying that any day now I’m going to get around to taking regular lessons, training in dressage, doing groundwork in the yard, and putting some miles in on the trails. It hasn’t happened in the nearly 15 years I’ve had horses, and it’s not going to happen. It was a story I told about who I was, one I was very attached to, but it wasn’t true. It’s time to stop telling it. I have had plenty of frustrations. I have faced challenges. I have been discouraged, injured, sick, busy… Rather than pointing the way toward this realization, those things actually kept me from seeing it. I thought things would be different when when my mare was healthy. I’d finally be able to commit to the time when I had the perfect job. Once my health was back on track, then things would work out. And after I’d gotten Rainy, it was that he wasn’t quite trained, and when he was a better horse, and after I had a year of Aikido behind me so I could be a better horseperson for him, then I’d ride all the time. Well I have the perfect job, I’m healthier than I have been in years, maybe ever, Rainy had a very successful four months of training, I’ve been training in Aikido for almost two years. Short of winning the lottery and hiring staff, the circumstances don’t get any better than this. And I’m still not riding. It took me a year to fully recognize and explore the reality of the issue – to be certain I wasn’t just frustrated or discouraged with riding, or temporarily swept up in the intensity of learning a new discipline. Possibly looking for a shiny new identity to glom onto. The truth is that I work, I train, I write. I do gardening and photography. I spend weekends doing chores, running errands, and going on adventures with Michael. What I do not do is ride my horse. 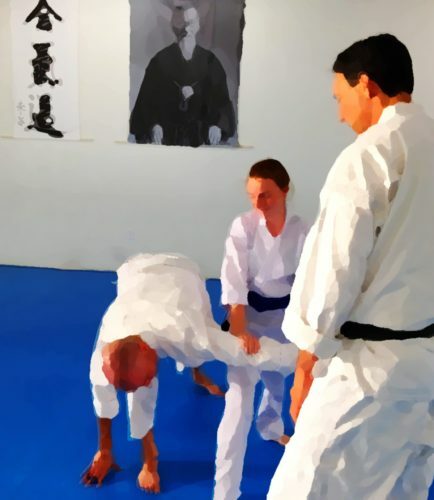 The central focus of my life has become Aikido. Not Aikido to improve my horsemanship. Not Aikido to become a better rider. Not for balance or strength or safety. Not in order to. Just Aikido. When I finally saw and accepted where I was, and where I was going, after one Tuesday night’s class about exactly that – noticing where you are, noticing where you are going, and accepting it, so that you can go effectively in that direction – I wrote a note to Sensei, who has been an occasional sounding board as I have worked through the decision, or maybe discovery. Putting it down in words, finally telling someone, made it real for me. That next evening in class I felt more “there” than I ever had. Rooted where I was, not drawn off balance by the pull of another side of myself, having somewhere else I should be, or trying to exist in two places at once. Several people commented, both in class and afterward, that my technique was really good. Things seemed simple, clear, easy. Settled. At first, maybe a year ago, I found this whole idea very upsetting. It was contrary to everything I’ve seen myself to be for most of my life – everything I worked very hard to be. I pushed back, denied it, and tried to find ways around it. I explored it over many months, sat with it, and now have accepted it. Rather than feeling a sense of loss, there is a sense of freedom. New space to explore. And integrity. Coming into alignment with myself.